Tastes like an ‘Anheuser-Busch product’ is the most cutting condemnation a friend of my mine can offer when judging a beer. I’ve also had the request, ‘Do you want the rest of my beer? I just can’t stand the metal taste.’ This is the rhetoric of the ‘beer snob.’. The lynch pin of beer snobbery is the avoidance and denigration of the beer can. 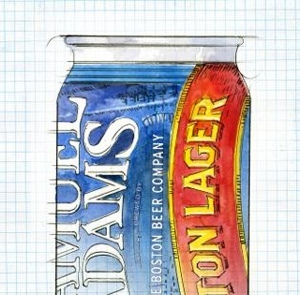 Hold on to your pop top because Sam Adams will be selling brew in a C-A-N! I wave my pull tab at your auntie! There is no more perfect container for beer. The enemy of liquid gold is light. Cans allow no light to the beer. There is no more loose bottle top to let air into the mix. As far as the metal taste, that is basically urban legend that has become ‘fact’ in the minds of the snobbery. The can has been popped and other craft beers are sure to follow. Anti-Beer Snobs Unite…Yes We Can! Posted on February 23, 2013, in Business, Life and tagged ale, Anheuser-Busch, beer, boston business journal, bottle, can, lager, Pilsner, Sam Adams. Bookmark the permalink. Leave a comment.